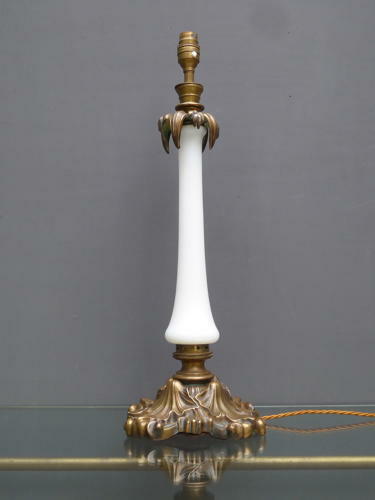 A beautiful antique opaline glass & bronze column lamp. A truly exceptional mid Victorian lamp featuring a cast bronze base supporting a tapered opaline glass column terminating in a fitting brass lamp holder. The casting to the base features some beautifully detailed, scrolling vine leaves & the Victorian 'Kite Mark', the upper section is finished with the same high quality casting to the leaves & the bronze retains a wonderful patina. A handsome, unusual & extremely high quality lamp. Wear commensurate with age, excellent condition for a lamp of this age.